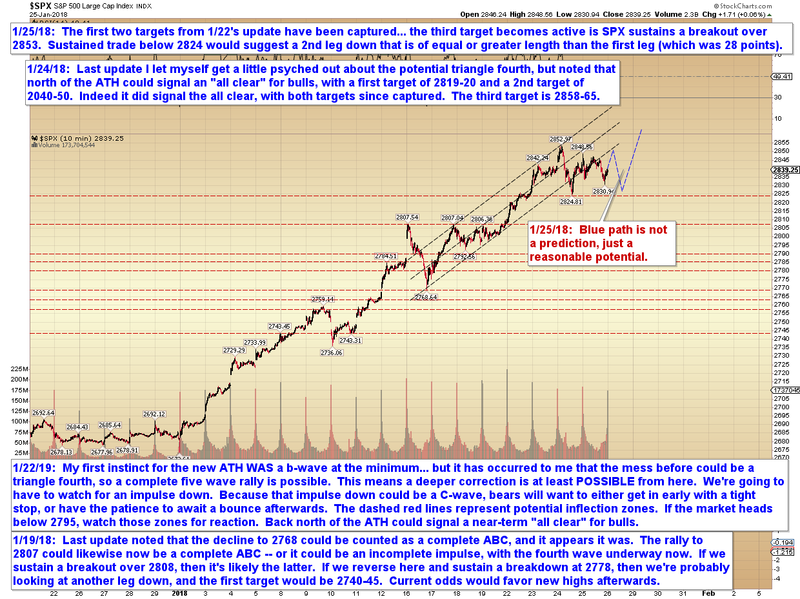 Last update noted that we had captured the upside target zones -- after which the market rallied a hair farther on momentum, then corrected. 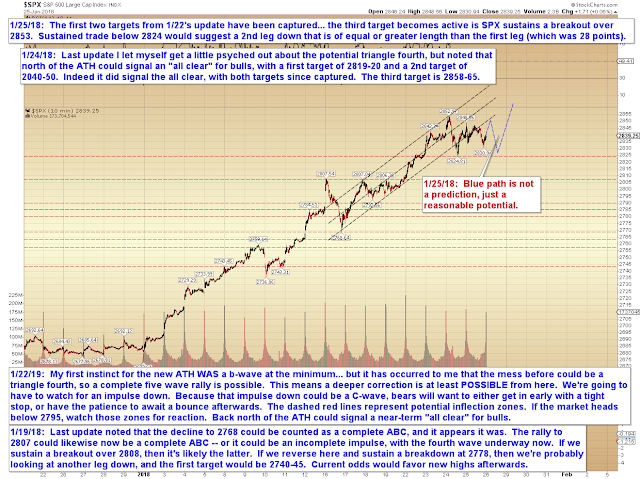 The $64,000 question now is whether that correction is complete, or if there will be another leg down. I'm leaning toward the idea that it's complete, but I certainly can't say that with 100% certainty. Below, I've sketched one possible path, based on the current wave structure. If we instead break cleanly past the all-time high, then we're likely headed directly to 2860-63. On the flip side of the coin, if we break down below Wednesday's low, we'd have our first "lower low" in a long time, and that would suggest at least 28 points against the prevailing reaction high (45 points down would be the 2nd target) -- and possibly more. Don't get too attached to the blue path -- there are some signs that may be the market's plan, but it's not entirely clear. 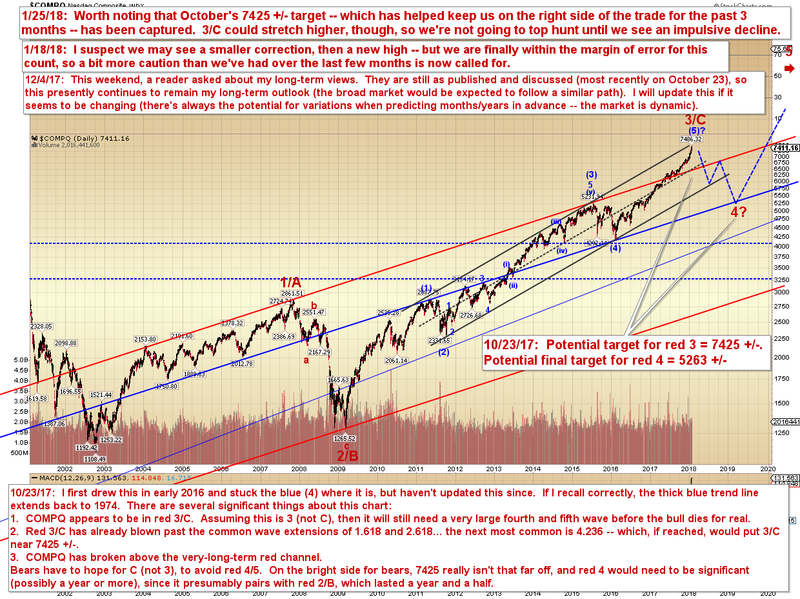 It's also worth noting that the long-term target from October has been reached in COMPQ. When I first published the chart below, I wasn't certain we'd reach the target, but it became obvious rather quickly that we were likely to do so, and this chart has helped keep us on the right side of the trade for the past few months. It will be interesting to see if the market reacts to this zone, beyond the current minor hiccup. In conclusion, we do finally have a few mixed signals from the pattern, so we can't just "close our eyes and buy," the way we've been doing for the past few months. That said, it's up to the market to show us whether it plans to react to this zone or not. Whether it powers higher or breaks down, at least we know the next price zones to watch. Trade safe.